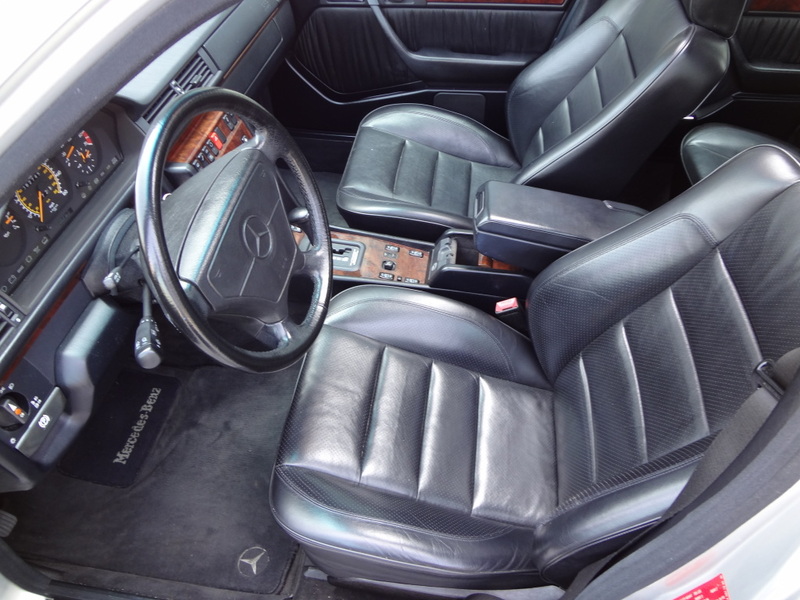 1993 Mercedes-Benz 500E: Are Values for Good Ones on the Rise? Among the interesting trends we noted at the Essen show last week was very strong asking prices for Mercedes-Benz W124 500Es. Even considering the Essen +/- 10% surcharge, sellers were looking for money starting about $30K for slightly worn cars to at least one decent but not perfect car with an asking price in the neighborhood of $90K. Considering that’s what they sold for new, that one seemed just a tad optimistic to me, but it got me wondering: are the values for clean, original 500Es poised to increase substantially in the next few years, and consequently, should I be buying one now? We have covered the background of the 500E before, but suffice it to say that after AMG proved that they could make a W124 sedan perform like a supercar with their V8-engined Hammer, Mercedes wised-up and in the tradition of their great super saloons of old – the 300SEL 6.3 and the 450SEL 6.9 – they shoehorned the 322hp 32-valve V8 from the R129 500SL into the W124 chassis, with a little help from their friends over at Porsche. While they were at it, they strengthened the chassis, widened the transmission tunnel, and added steel flares to the front and rear wheel arches, in addition to a host of other modifications to help the car better cope with its newly found power. The result was the fastest production super sedan ever to roll-off the Mercedes-Benz assembly line, the first ever production 4-door Porsche (arguably), and a car that could embarrass many a supercar driver reveling in his gold chains, white loafers, and his need for penile over-compensation. 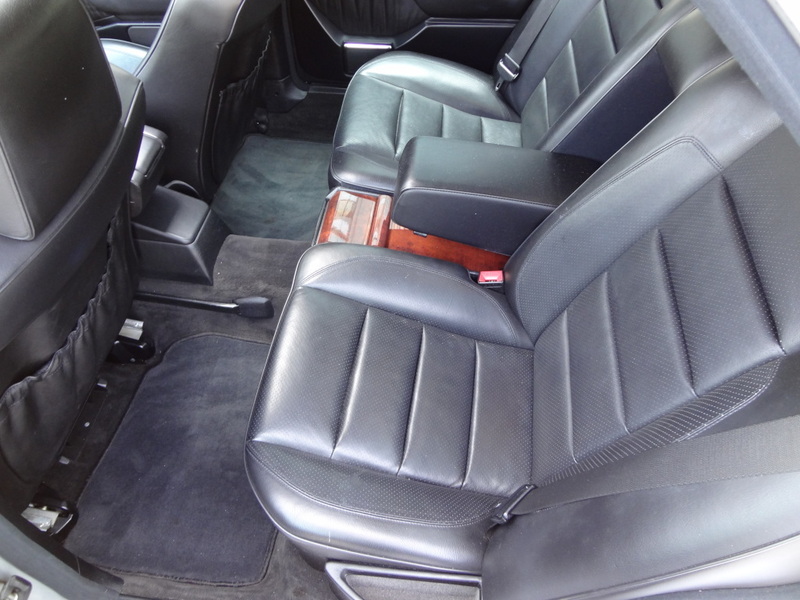 The inside of the US-spec 500E is mostly stock W124, albeit high-spec with Sportline 4-place front and rear sport bucket seats, heated seats, automatic climate control, sport steering wheel, and every other option that could be had in lesser W124s. They also had a traction control system that couldn’t be wholly defeated and in regular driving would start off the line in second gear. A few companies developed workarounds for those foibles, for those who considered them such. Having owned one before in standard configuration, I had no issue with either. Where the AMG Hammers were somewhat crude in their implementation and a little rough around the edges, it appears that the 500E was designed from the ground-up to be exactly what it is, and as such it retains the old Mercedes cliche “hewn from a single piece of ore” feel to it, from the stance of the chassis to the vault-like quality of the doors. It’s also supremely comfortable, and remarkably as easy to drive sedately as it is to flog some ignorant punter who decides to try and get the upper hand on you in a merge. But again, we’ve talked about all of this before. The question is whether there is, or will be soon, an upside for cars like this one currently for sale on eBay in my home town of Fairfax, Virginia with a Buy it Now price of $20,199? To start with, the chances of another Mercedes-Porsche joint venture car are probably very slim, for political reasons if nothing else. Now that Porsche offers cars like the Panamera and the Cayenne which compete directly with AMGified versions of Mercedes vehicles, there is no real benefit to working together on a car like this. Second, Mercedes won’t be hand-building anything even remotely affordable in the near future, and even in the years since the 500E came out that sort of attention has been lavished only on super-high-end cars like the Maybach, the SLS, and the McLaren-built SLR. 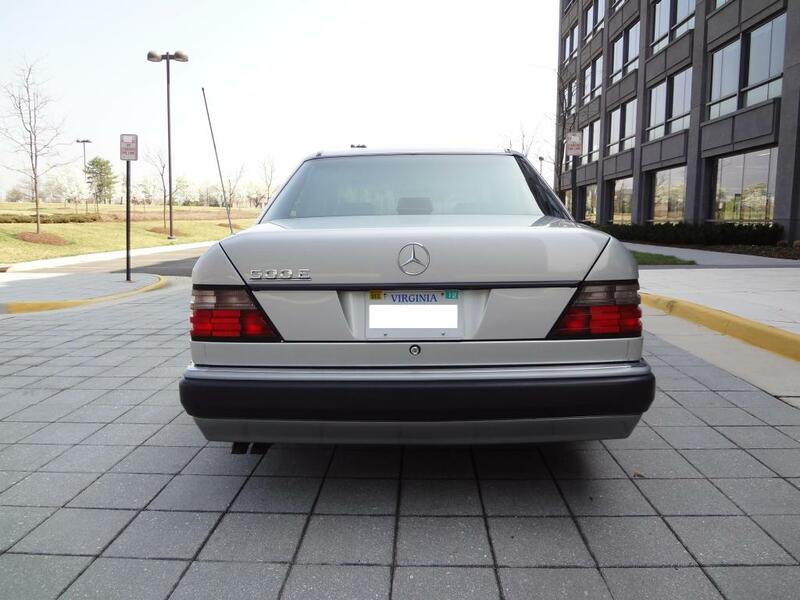 Third, the 500E has several unique parts to it beyond the motor, including the flared fenders, wheels, and even the headlights which have powerful driving lights in place of the standard W124 fogs. Modern AMG-versions of Mercedes cars may offer some plastic ground-effect type modifications, but the E63 shares every single bodypart with the E350, which really somewhat takes away from the car. Fourth, they only made a total of 10,479 of these in 500E and E500 form, and a lot of them have been thrashed, trashed, or have run-up extreme mileage. The argument against is that at over 10,000 produced, they will never be that exclusive in the grand scheme of car collectability. Likewise, they are sedans, which do not seem to carry the same kind of collectible cachet that coupes, cabriolets, and roadsters seem to. Last, to the untrained eye they look perhaps a little too similar to the average 300E, which these days looks like a pretty old car. Still, sites like eBay have opened-up big markets for special cars like these, and even if the average American doesn’t recognize the 500E for the marvel that it is, there are a whole lot of Germans who do, and whose currency is still a far bit stronger than ours in the open market. My verdict – this is a pretty small price to pay for the specialness that is the 500E in this condition, and there are plenty more out there. It may not beat a new E63 or M5 at the drag strip, but compare depreciation and values a few years down the line. Don’t believe me? 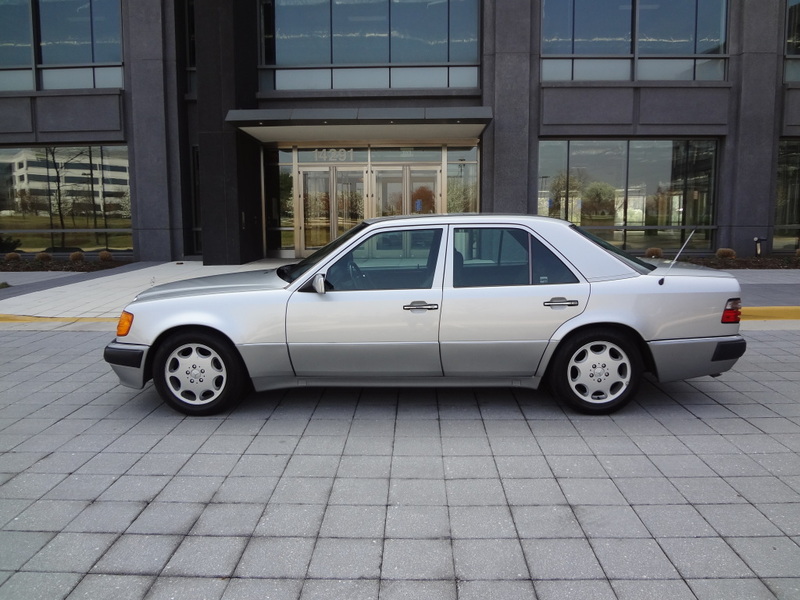 Just look at current prices on W210 E55s. ‘Nuff said. This entry was posted on Friday, March 30th, 2012 at 9:37 AM	and tagged with 124.036, BMW M5, E500, Mercedes-Benz 500E, R129 500SL, Sportline, Techno Classica Essen, W124 and posted in Totally That Stupid. You can follow any responses to this entry through the RSS 2.0 feed. The closing paragraph are simply false. ALL w210 is less valuable than w124. 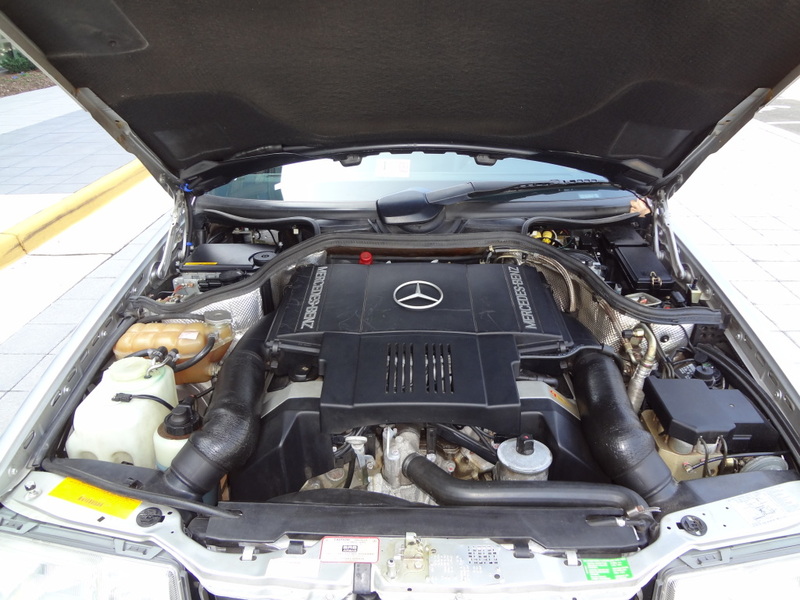 Therefore to compare e55 w210 values with e500 w124 is no contest. The w124 is the best all time.